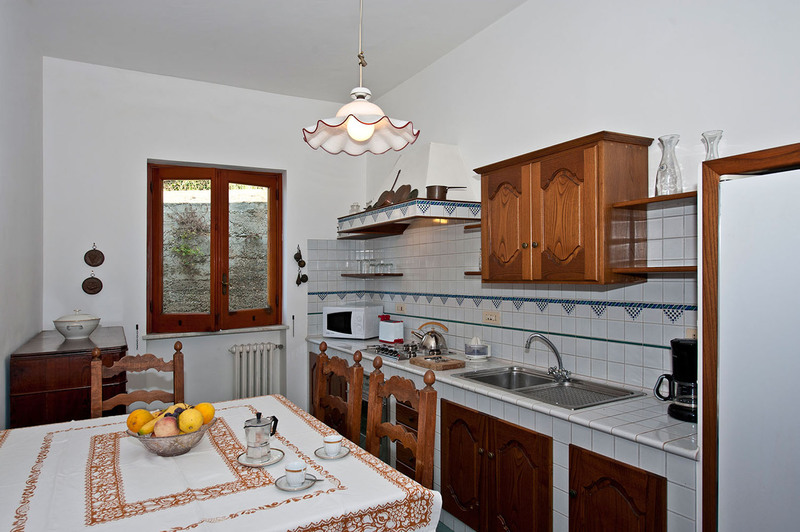 Casa Dalia is a charming small house of Praiano, with a splendid view over the Mediterranean sea and Amalfi’s coastline. The house is set in an elevated position, in the pedestrian area of Praiano and provides easy access to shops, bars and excellent sea food restaurants. Just 300 meters far from the property is a bus stop, both for the local bus and for the bus that takes to the other villages of the coast. From the bus stop, a 5-minute walk up the hill takes to a private, pedestrian lane with 15 step stairway which lead to the entrance door. 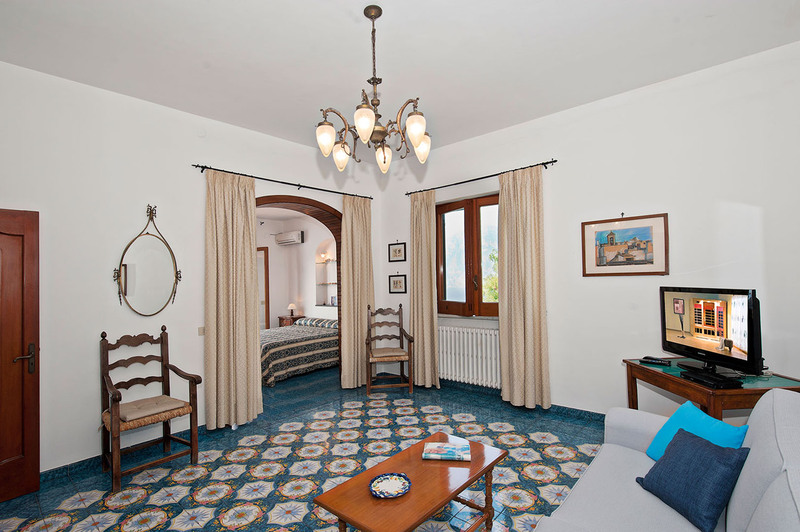 Recently modernised, Casa Dalia features rooms full of air and light and hand painted majolica tiled floors, typical of the Amalfi coast. It is furnished with comfortable contemporary furnishings complemented by modern amenities, including modern, complete bathrooms, a kitchen packed with appliances, air conditioning, winter heating and satellite television. 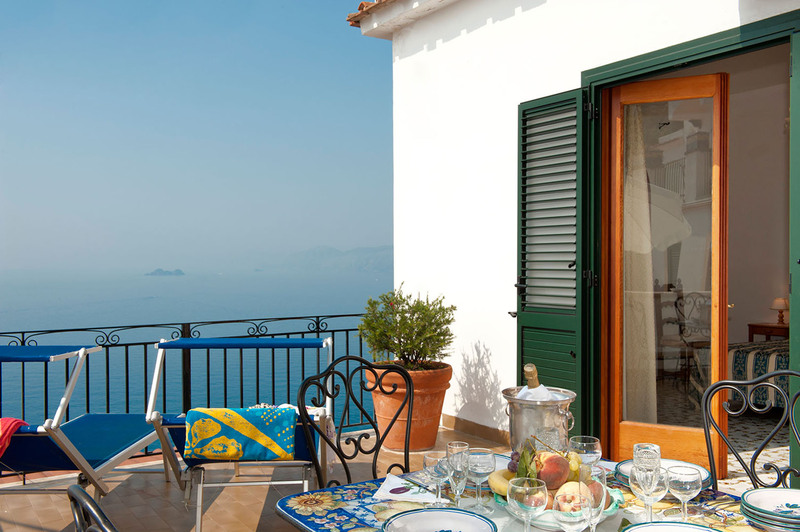 Both bedrooms are spacious and furnished with a double bed and each has access to its own private terrace with wonderful views of the sea and of the arch- shaped stretch of coast which goes from Praiano to Positano up to Punta Campanella and the island of Capri. Terraces are furnished with large white umbrellas, tables with chairs, and deck chairs. A car is not necessary during your stay at Casa Dalia but if you have one, parking is available in a private parking at approximately 800 meters away from the house. The kitchen features a solid wood dining table seating 4 people and cupboard on one side while the other side features the cooking area with a five-burner stove, an oven, a large fridge with freezer, and small electrical appliances such as toaster, kettle, blender, microwave, etc. 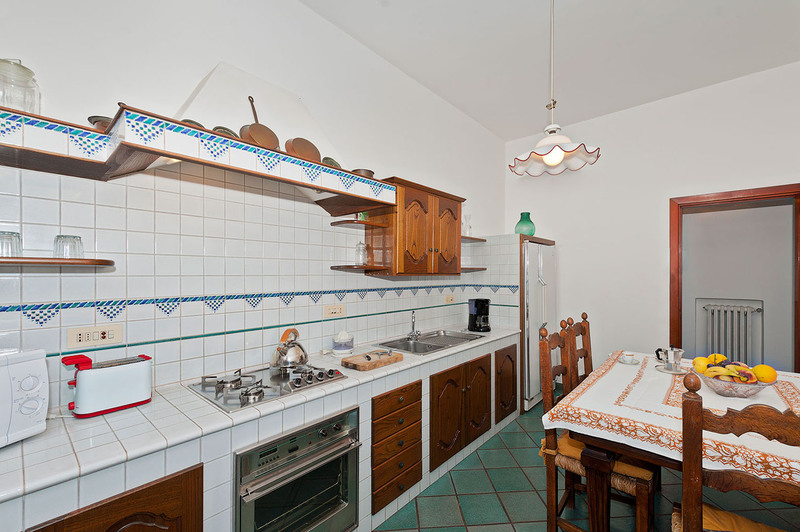 Next to the kitchen is the living room which is a spacious and bright room with a luminous floor made of local majolica tiles. Here you will find a table and chairs, a comfortable sofa, a television and windows with views. there is a double bed and a lovely old dresser . The bedroom is illuminated by a large arched glass window which takes the whole wall and leads to a terrace with a magnificent view of the sea. The terrace is large enough to have a table with chairs shaded by a sun umbrella. 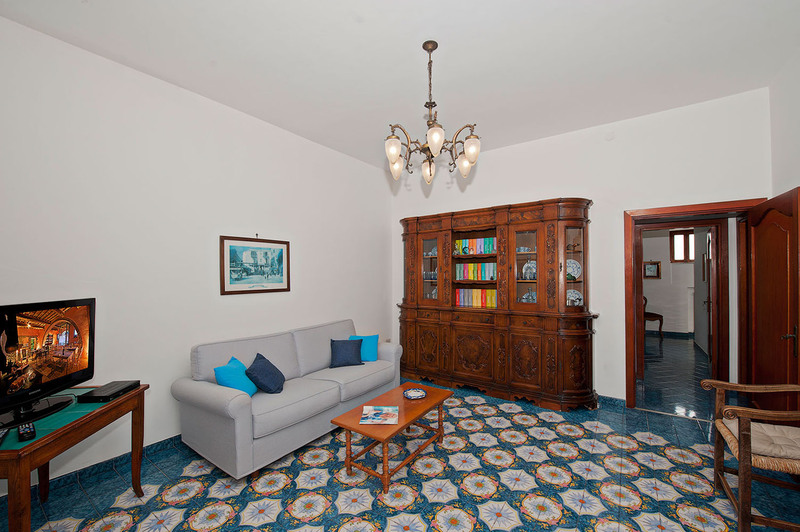 The living-room is close to a large and elegant bathroom which is tiled with green hand painted majolica tiles. It features a bathtub, WC, washbasin and arched window which looks into the sea. The second spacious double bedroom, also accessible from the corridor, enjoys a large window which looks into the sea and French doors leading into a second and even larger terrace with the same glorious view. This terrace too is furnished with loungers and a dining table with chairs shaded by a large, white sun umbrella . Adjacent to the bedroom is a bathroom with shower, WC, washbasin, etc. 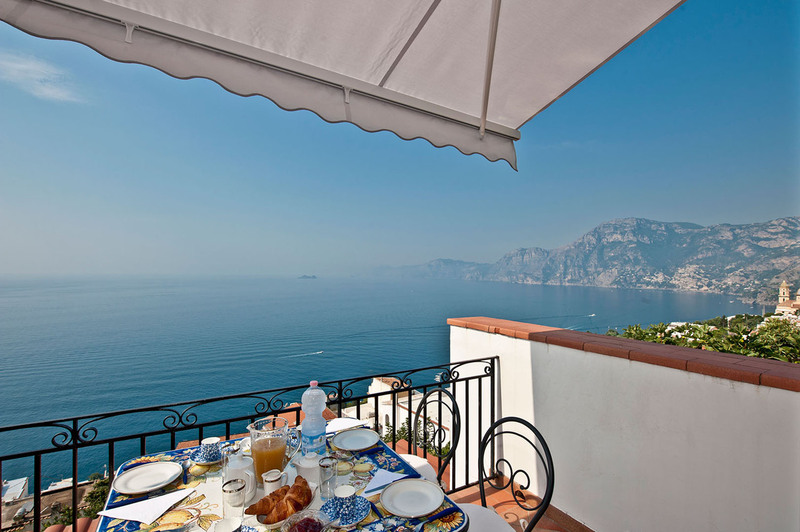 Access: Casa Dalia is reached by walking up the hill along the internal road of Praiano for approximately 300 meters from the centre of the village where is also located the bus stop to Amalfi and Positano/Sorrento. Access is along a private pathway , which is lit at night, about 100 meters long and 15-step stairway. Facilities: Air conditioning and central heating, washing machine, satellite TV, radio/CD-player, four-burner cooker with electric oven, refrigerator with freezer, microwave oven, toaster, kettle, ironing facilities, hair dryers. A very good general food shop can be reached within a moments walk; bars and restaurants are within 5 mins walk . The pebble beach at La Praia can be reached not only on foot or by public transport. The inlet , enclosed by high cliffs , is home to several restaurants offering excellent local cuisine, boat hire service and a sub-aqua school . 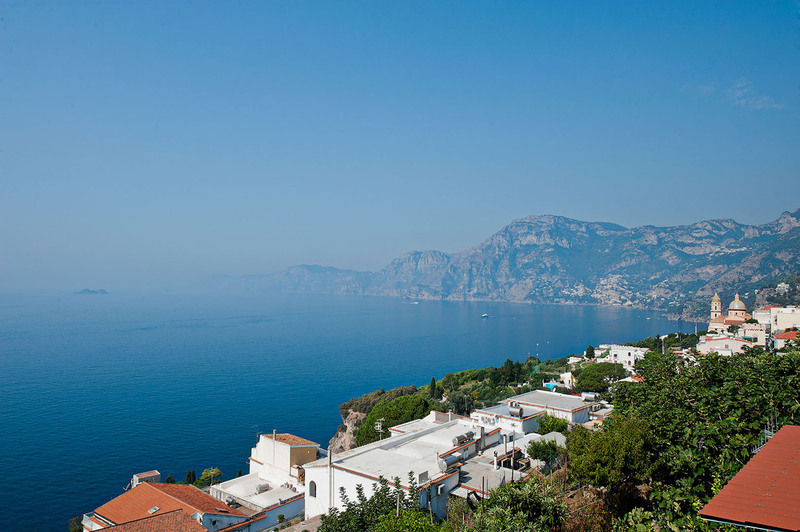 Positano is 7 Km away, Amalfi 12 Km, Ravello 16 Km , Sorrento 18 Km, Salerno 45 Km. Naples airport 50 Km, Rome Fiumicino 269Km.